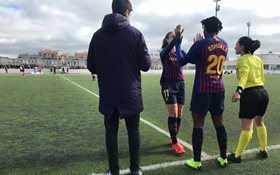 Super Falcons striker Asisat Oshoala netted in her maiden appearance for Barcelona Femení as they recorded a comprehensive 4-0 win against Rayo Vallecano at the Ciudad Deportiva Rayo Vallecano Campo 4 (Madrid) on Sunday. The Dalian Quanjian loanee replaced Alexia Putellas in the 62nd minute and opened her account for the Blaugranes less than a minute later which wrapped up the impressive victory. Barcelona had established a three-goal cushion by the half-hour mark courtesy of goals from Alexia Putellas, Marten and Mariona. Oshoala's 63rd minute goal against Rayo Vallecano is the fastest ever debut goal she has scored for her European clubs. The FC Robo product scored 46 minutes into her debut for Arsenal Women in a 3-1 victory against Reading on March 23, 2016 and opened her account for Liverpool Women after spending 115 minutes on the pitch in what was her second game. The three-time African Women's Footballer of the Year is in line to make her home debut for Lluís Cortés' side against Sporting de Huelva on Wednesday, February 13.